Learn to Surf - Private and Group Lessons Available - All ages and skill levels welcome! Cocoa Beach Parasail is the premiere parasail concession on Florida's east coast, bringing over a decade of flight experience to the Space Coast region. CFLsurf - Everyones favorite local surf forecast - covering central Florida. Links to all the best cams & local reports. 2nd Light - Takes a picture of the surf at 2nd Light every morning. One of the areas most consistent waves. Long board House // Good beginner boards available. CFL ESA chapter Home of the Central Florida Eastern Surfing Association. Szabad - The best soft surfboards in the world! Elemenohpee - This bodyboard manufacturer also puts out some very nice soft boards. Silverfish Surf Sunglasses - Surf sunglasses, prescription water sports eyewear for surfing, windsurfing, kitesurfing or other water, snow or extreme sports and conditions. In and out of water. Boating, kayaking, rx, goggles, wrap around. Wide Selection. SLINGZT is a unique Hands-Free Skateboard Strap for Skaters who traverse all terrain. Yoga With Helena ~ The studio is located in Indian Harbor Beach. Yoga For Surfers ~ Their new DVD is out, so they have one for getting warmed up to surf and one for more of a workout. Surf Express ~ Travel agency for surfers by surfers. They can take you to the best destinations like Costa Rica, Mexico and beyond! Sunny Beach Vacation Rental. Ocean front executive & family beach rentals. Florida Today Surf Page - Showcase of local events for the Brevard County Area. Dakine - Bags, leashes, board bags. Surfco Hawaii - Makes the Pro-tech fin system, the safest available! 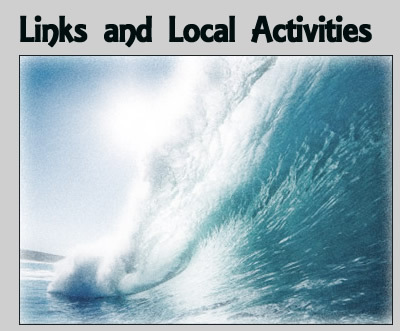 WannaSurf - Surf break information from all over the world. Surfline - Surfline's home page for worldwide surf reports.